We propose a new model for long-range information exchange in bird flocks based on the projected view of each individual out through the flock. Visual input is coarse grained to a pattern of (dark) bird against (light) sky. We propose the simplest hybrid projection model that combines metric-free coalignment, and noise, with this projected view; here the birds fly toward the resolved vector sum of all the domain boundaries. This model leads to robustly coherent flocks that self-assemble to a state of marginal opacity. It therefore provides a mechanism for the control of density. Although it involves only two primary control parameters, it also gives rise to several distinct phenotypes. We compare our predictions with experimental data. Swarming is a conspicuous behavioral trait observed in bird flocks, fish shoals, insect swarms, and mammal herds. It is thought to improve collective awareness and offer protection from predators. Many current models involve the hypothesis that information coordinating motion is exchanged among neighbors. We argue that such local interactions alone are insufficient to explain the organization of large flocks of birds and that the mechanism for the exchange of long-range information necessary to control their density remains unknown. We show that large flocks self-organize to the maximum density at which a typical individual still can see out of the flock in many directions. Such flocks are marginally opaque—an external observer also still can see a substantial fraction of sky through the flock. Although this seems intuitive, we show it need not be the case; flocks might easily be highly diffuse or entirely opaque. The emergence of marginal opacity strongly constrains how individuals interact with one another within large swarms. It also provides a mechanism for global interactions: an individual can respond to the projection of the flock that it sees. This provides for faster information transfer and hence rapid flock dynamics, another advantage over local models. From a behavioral perspective, it optimizes the information available to each bird while maintaining the protection of a dense, coherent flock. Starling murmurations represent one of the most impressive examples of organization in the natural world, with flocks of up to 300,000 individuals or more able to coordinate themselves into a cohesive and highly coherent group. Although the primary source of sensory information to a bird is visual, it would be unrealistic to expect that individual to recognize and track the position and orientation of a significant proportion of the other members of a flock. Indeed, observations on real starling flocks show that a bird responds to this type of information only from its seven nearest neighbors and that these interactions are scale-free. Local interactions such as this are enough to create order within a flock but do not give any information on the state of the flock as a whole, nor do they explain how density might be regulated. Most models use attraction and repulsion interactions, use a fictitious potential field, or simply fix the available volume to control the density. To make progress, we first ask a simple question: “What does a bird actually see when it is part of a large flock?” Its view out from within a large flock likely would present the vast majority of individuals merely as silhouettes, moving too fast and at too great a distance to be tracked easily or even discriminated from one another. Here the basic visual input to each individual is assumed to be based simply on visual contrast: a dynamic pattern of dark (bird) and light (sky) across the field of vision (although it might be possible to extend this to other swarming species and environmental backgrounds, respectively). This has the appealing feature that it also is the projection that appears on the retina of the bird, which we assume to be its primary sensory input. overlapping individuals (dark) almost everywhere it looked. Conversely, an isolated individual, detached from the flock, would see only sky (light). The projected view gives direct information on the global state of the flock. It is a lower-dimensional projection of the full 6N degrees of freedom of the flock and therefore is more computationally manageable, both for the birds themselves and for the construction of simple mathematical models of swarm behavior. The information required to specify the projection mathematically is linear in the number of boundaries. Our simplifying assumption is that the individual registers only such a black-and-white projection (in addition to nearest-neighbor orientation). This information, then, is all that would be available to an agent, regardless of the behavioral model that might be chosen. Individuals in a flock that is sparse enough for them to typically see a complex projected pattern of dark and light have more information about the global state of the flock. Such sparse flocks also allow an individual to see out in a significant fraction of all directions, which would allow the approach of a predator, or at least the response of distant individuals to the approach of a predator, to be registered. Conversely, a dense, completely opaque flock would offer little information about either the global state of the flock or the approach of predators. In the remainder of this article, we focus on proposing a model for how bird flocks organize and specifically on how the global density is regulated, which remains an open question. We develop what we believe to be the simplest possible model that takes the projected view described above as sensory input while retaining coalignment with (visible) nearest neighbors and allowing for some noise. We then compare the swarms generated by this model with data. 0.059. 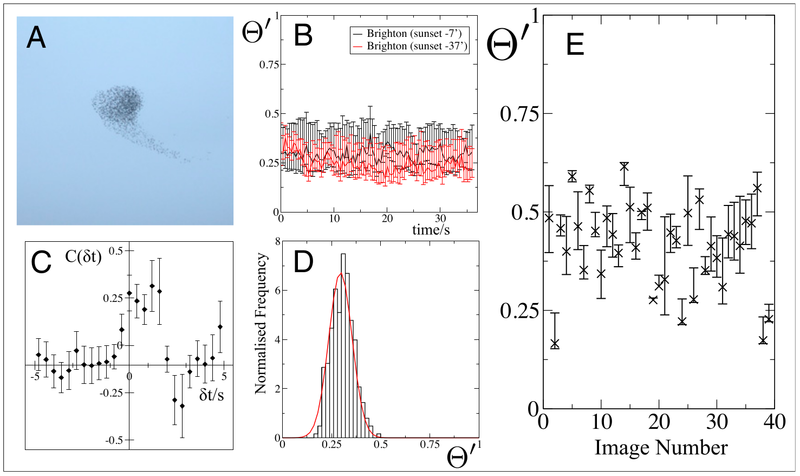 (E) The opacity Θ′ of images of starling flocks in the public domain (μ = 0.41, σ2 = 0.012). In both D and E, the null hypothesis that the opacities are drawn from a uniform distribution on [X,1] can be rejected at the 99.99% confidence level for all values of X. These flocks are all marginally opaque. See SI Appendix for details throughout. We believe opacity may be related to evolutionary fitness in flocking animals. Dense swarms are thought to give an advantage against predation due to target degeneracy, in which the predator has difficulty distinguishing individual targets (22). Balancing this is the need for the individuals to be aware of the predator so as to execute evasion. In flocks with very high opacity, only a very small fraction of all individuals would be able to see out of the flock and monitor either the first or subsequent approaches of the predator. Individuals in the interior of such a flock could neither see the predator directly nor respond to the behavior of individuals near the edge that were able to see it. Information about the approaches of a predator instead would have to propagate inward, being passed from (the behavior of) neighbor to neighbor, i.e., very much slower than the speed of light, which instead would operate on a clear line of sight. The state of marginal opacity therefore would seem to balance the benefit of compactness (target degeneracy) with information [“many eyes”]. In particular, very little information would be gained by decreasing the opacity beyond a marginal state. Thus, projection-based models that give rise to marginally opaque states would seem to be both cognitively plausible and evolutionarily fit.